MOSCOW, March 5. /TASS/. 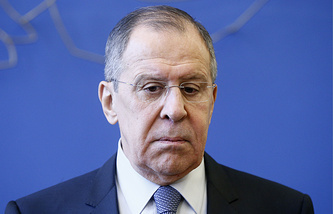 Russian Foreign Minister Sergey Lavrov plans to discuss the fight against terrorism and ways to boost trade and economic cooperation during this tour of African countries beginning on Monday, as he himself said in an interview with the Hommes d'Afrique Magazine. According to Lavrov, his tour of Angola, Zimbabwe, Mozambique, Namibia and Ethiopia is aimed at strengthening ties in various fields and searching for new areas of trade, economic, scientific, technical and humanitarian cooperation. "We expect a thorough exchange of views on a wide range of regional and global issues, including the fight against terrorism, steps to resolve crises, particularly in the Sahara-Sahel region, the African Horn and the Great Lakes region," the Russian top diplomat noted. Lavrov also said that Moscow placed great importance on boosting ties with Africa’s regional and sub-regional organizations, first and foremost, the African Union. In this regard, he mentioned his planned meeting with African Union Commission Chairperson Moussa Faki Mahamat. "We intend to touch upon relations between Russia and the African Union and discuss the organization’s role in finding appropriate responses to the numerous challenges and threats that the world has been facing," Lavrov added. The Russian foreign minister went on to say that economic cooperation between Moscow and African states was "not as active as political interaction." "However, our economic cooperation showed some growth in the recent years," he said, adding that Russia’s "trade with African countries located south of the Sahara was recorded at $3.6 bln in 2017 compared to $3.3 bln in 2016 and $2.2 bln in 2015." "Today, Russian companies participate in exploration and mining projects in Africa, they are also active in the energy field," Lavrov noted. Besides, in his words, transport and agriculture are also among the most promising areas for cooperation between Russia and African countries. "We believe there is a need to facilitate joint activities in order to unleash the potential of bilateral trade and investment cooperation," the Russian top diplomat stressed. Russia has also been cooperating with African countries in the high-tech industry, Lavrov went on to say. "Rosatom [Russia’s State Atomic Energy Corporation - TASS] has been working on a number of projects that are of interest to African states," he said, adding that those projects included the establishment of a nuclear science center in Zambia, there was also a similar project in Nigeria. "There are good prospects for joint activities in Ghana, Tanzania and Ethiopia," the Russian top diplomat noted. "Talks on the construction of a nuclear power plant in South Africa are underway," he added. "I would like to reiterate that we will continue to do everything in our power to ensure that the level of our trade and economic ties are in line with the high level of our political cooperation," Lavrov concluded.